Tis’ the season for wrapping presents, snowball fights and decorating the house for the holidays. 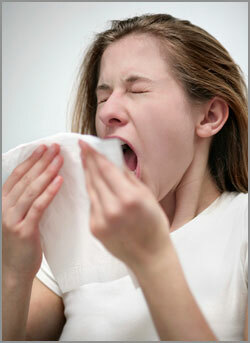 While this time of year brings so much joy to our lives, it can also bring lots of sneezes and runny noses! What exactly is causing our noses to run and our eyes to feel itchy? You don’t have to look too far for the answer because, chances are, it is sitting right in front of you beautifully disguised as a decorated tree with a majestic star on top! Christmas trees and wreaths, both live and artificial, can be a major trigger for allergies. While the live evergreens are beautiful, they are typically the home for many pollens and molds. Bringing a live tree into your home allows those pollens and molds to spread throughout your house. Even when the tree is gone, those molds and pollens are still lingering around, repeatedly triggering your allergies. Artificial evergreen trees and wreaths are a much safer option for those with allergies, but they can still house dust and mold, especially if they become damp. So what is one to do to reduce the risk of Christmas Tree Allergies? In order to help keep those molds and allergens from spreading throughout your house, it is recommended to wash the tree and its branches before bringing it inside. Be sure to let it dry thoroughly to prevent new molds from growing. Ideally, a live tree should only be in your house for 7 days and then removed before significant decay occurs. With a fake tree, keep it well covered when placed in storage to keep the dust exposure to a minimum and to protect it from getting damp. If you follow these simple guidelines, you can minimize those Christmas tree sniffles and maximize your enjoyment of the holiday season!